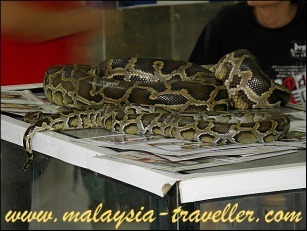 The Penang Snake Temple is one of the few places where you can get up close to a bunch of venomous snakes and live to tell the tale. 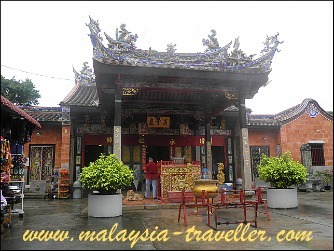 The Snake Temple, officially known as Hock Kin Keong or Cheng Hoon Giam, was built for the worship of the deity Cheng Chooi Chor Soo, also widely known as Chor Soo Kong. Chor Soo Kong was a Buddhist monk who lived about a thousand years ago in Fujian, China. He was held in high esteem by the Chinese because of his spiritual enlightenment, great virtue, medical knowledge and good deeds during his lifetime. He was deified after his prayers for rain succeeded in ending a terrible drought in Fujian province. In 1850, a monk arrived from China bearing a statue of Chor Soo Kong. 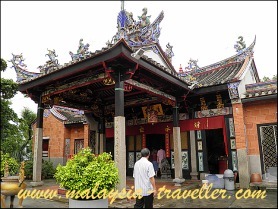 The monk built a temple dedicated to Chor Soo Kong in a clearing by the Sungai Keluang river in Bayan Lepas, Penang. After completion of the temple, snakes from the surrounding jungle began taking shelter in the temple which soon came to be known as "The Snake Temple". The temple may once have been surrounded by jungle but today it sits alongside a busy highway in an industrial estate a couple of kilometres from Penang's Bayan Lepas airport. All this development means that snakes in this area are few and far between. It is whispered that the ones that reside in the temple nowadays are returned to the temple's snake farm cages at night and brought out again every morning. When I visited the temple there were probably a dozen or so snakes, said to beWagler's Pit Vipers or Temple Pit Vipers, coiled around what look like bamboo hat stands in front of the altar and in a side room. There was another snake draped on top of an old photo frame just feet above people's heads, many of whom were unaware of its presence. This may be all stage-managed for the tourists but these are real snakes, they're venomous and there is no glass or cages to restrain them. Some say that the incense smoke makes the snakes drowsy and docile. Others say that the snakes are de-venomed and anyway, nobody has ever been bitten by one. Well there's always a first time so I was careful to look where I was stepping and putting my hands. Apart from the pit vipers, there were a couple of large pythons under the supervision of their handler who would allow you to wrap one your neck for a photo opportunity for a fee. 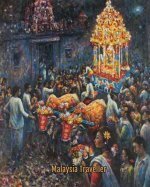 Every year, thousands of devotees make a trip to the temple during the birthday celebrations of Chor Soo Kong which, oddly, occurs thrice yearly, on the 6th days of the first, sixth and eleventh months of the Chinese lunar calendar. The rest of the year it is the tourists who make up the bulk of the visitors. Besides the main snake temple, there is an additional hall at the rear devoted toKuan Yin, the Goddess of Mercy. 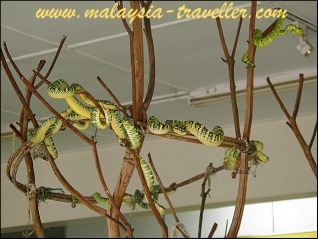 Other attractions include a giant bell, a couple of wells, and a small snake farm said to contain 50 species of snakes. There is a shop at the entrance selling nutmeg juice. This was the first time I had tried nutmeg juice and it was very tasty. Nutmeg is one of Penang's famed products. The temple is open daily from 6am to 7pm. Entrance to the temple is free. Donations are most welcome. 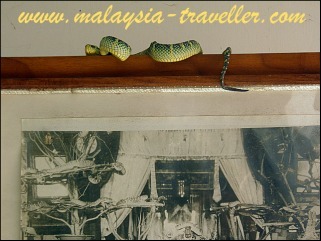 If you want to buy a photo of yourself with a large snake wrapped round your shoulders you can expect to pay RM30. Penang Snake Temple is easy to find. 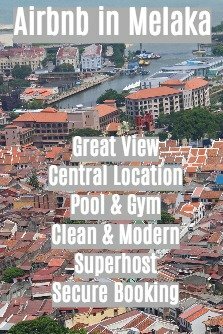 From George Town just follow the signs to Bayan Lepas and the airport. The distance is about 10km. When you get closer you will see brown tourist signposts showing the way. There is free parking in front of the temple. 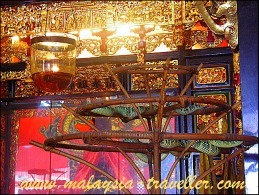 The location of the temple is marked on my map on the Top Penang Attractions page.